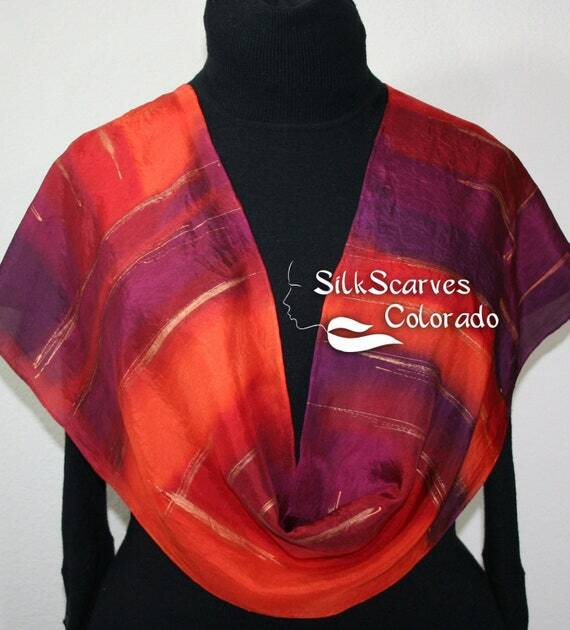 Silk Scarf Red Orange Plum Handpainted TROPICAL SPLENDOR, by Silk Scarves Colorado. Select Your SIZE! Birthday Gift, Christmas Gift, Anniversary Gift. Bridesmaid Gift, Valentine Gift. Spring Scarf, Summer Scarf. Gift-Wrapped. Elegant Handmade Silk Scarf. Hand Dyed Silk. Handmade in Colorado, USA. 100% silk. This is a 100% habotai silk (smooth China silk) scarf, featuring segments in warm shades of red, orange, burgundy, plum (warmer purple). Decorated with metallic accents in bronze. It is a very chic scarf, that makes a great accessory to any outfit. - Bandanna Square: 22" x 22" (56 cm x 56 cm).